The University of Southampton’s new Mayflower Halls was declared open today at a plaque unveiling by Southampton MP John Denham. 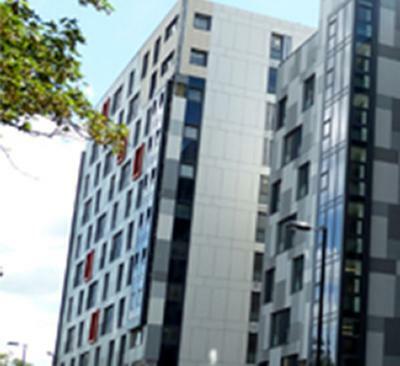 The new student accommodation comprises three residential blocks of up to 16 floors and will house 1,100 students. Situated opposite the Mayflower Theatre, the new halls are a return to the heart of Southampton for the University, where it was first founded in 1862. The build represents an £80m investment in the city and will include a convenience store and onsite gymnasium. Student residents will be able to take a direct bus to attend lectures at the University’s various campuses, while enjoying the convenience of a city centre location, close to Southampton Central station. It is hoped the new accommodation will help to ease pressure on Southampton’s private housing stock. John Denham MP, a former student at the University, spoke at the opening which was attended by councillors, University staff and the site’s developers, Osborne Developments. He said: “The University is really important to the City and these new halls of residence are a fantastic addition to Southampton’s landscape. The University already has places for 4,760 students in halls across different areas of Southampton, as well as a further 500 places in Winchester for students at the Winchester School of Arts. The new halls will increase capacity for first-year undergraduates, as well as accommodating some students in subsequent years of study. It will also make rooms available for a number of first-year postgraduate students. Mayflower Halls is a partnership project between Osborne, Legal and General, Terrace Hill and the University of Southampton.